At a retreat in Italy, I found myself trimming rose geraniums with a Benedictine Monk as a part of our morning service. Guri and I had first run into him a decade ago, just couple days after our marriage. It was almost an accident, as we walked into a friend's home for the first time and he happened to be walking down the stairs. Although strangers at the time, he greeted us with a big smile and when he discovered that we had just been married, he gave us a hug and blessed us in the most invisible but memorable way. From an outside glance, it would've looked like a fleeting moment in a hallway but Guri and I still remember looking at each other and thinking, "What was that?" Followed by, "Who is he?" 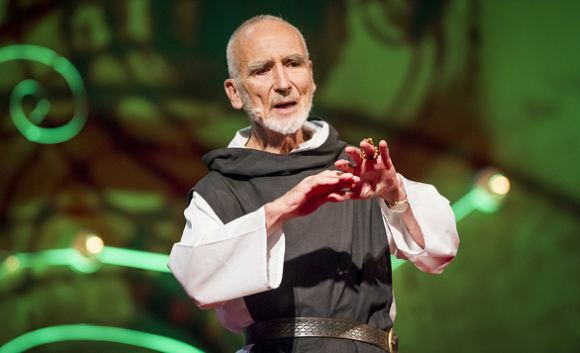 It ended up being Brother David Steindl-Rast. After that gathering, I went up to him to express my gratitude. Amidst the post-event chatter, our conversation went deep right away. We started talking about meditation, and I found myself asking him an unusual question: "How do you decide when to stop meditating?" Really, I didn't know much about his background, but he said, "I listen to my intuition. Sometimes it might just be a minute. Sometimes an hour, or a day. One time, I meditated for 14 years." Wait, what?!? Did he just say 14 years? I double checked and yup, no slip of the tongue there. I came home and Googled this monk named Brother David. 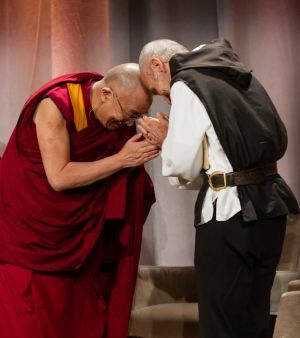 :) Born in Austria, he became a Benedictine monk in 1953 and got his PhD at Cornell. 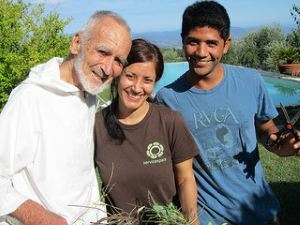 After a dozen years of monastic training, his abbot sent him to participate in Buddhist-Christian dialogue, for which he received Vatican approval. He has received many awards and authored numerous books, but the core of his message centers around gratefulness: "Everything is a gift. The degree to which we are awake to this truth is a measure of our gratefulness, and that gratefulness is a measure of our aliveness." Over the years, we'd run into him in various places. Serendipity is perhaps the only way to meet him, perhaps. 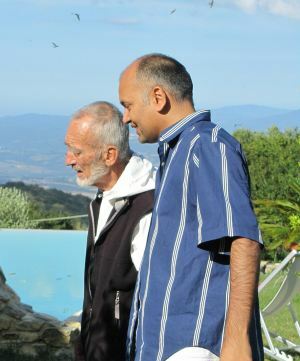 :) In 2012, at a 500 person conference on Love and Forgiveness in Assisi, he was the first person we ran into and had dinner together. He was the opening keynote, and quite in demand after that, but lo and behold, as the conference ended, we (Viral, Pavi, Guri and I) ran into him again on the streets of Assisi! He was with Anthony Chavez, grand-son of Cesar Chavez who often accompanies him on his travels, and we all ordered some pizza and gelato! "Is it true that you don't ask for anything, as a general practice?" I asked at one point during that dinner. "Yeah," he replied. Inspired by its direct resonance with ServiceSpace principles, I inquired what he had learned after sixty years(!) of this practice. "Well, you learn to be in the present moment and to be grateful for what you receive." Guri then probed further, "What if what you receive is suffering?" He smiles and says, "That's not possible. You may experience pain, but suffering is always optional." She then asked, "Do you believe in karma?" "Perhaps not as an idea, but in practice, it’s clear that there's a stream from the past to the future." "What ends that stream?" "Forgiveness ends the stream of negative seeds, and sacrifice ends the streams of positive seeds." We were sitting in front of a man who did not negotiate with reality. By not wanting anything, he learned to receive everything with a full heart. Couple months back, Brother David gave the opening talk at the Gratitude Summit. Because I was also speaking, I got a free ticket and invited a visiting friend from London to join. After his talk, amidst the flurry of 600+ people, Brother David approaches that friend in the first row and humbly asks him, "May I look in your eyes?" What happened to my friend transcends any articulation, but he later told me: "I didn't know anything about this man, but that one moment with him is something I can't forget for the rest of my life." So in Italy this week, while trimming the rose bush, I asked Brother David: "What made you single out that one fellow?" He paused to reflect, as the colored clippers in his left hand stood in stark contrast to his hooded white robes. You'd think he'd have canned responses to such mundane questions from curious minds. :) Yet, nothing seems rehearsed with him, as if he's preparing a dynamic response just for that moment. Here, he replied with just one word, "Intuition." I took it in because the silence around the words appeared to be as important as the word. Few moments later, I followed up with another child-like question, "And what did you see in his eyes?" He sincerely responded with a koan: "Oh, the same thing you'd see in his eyes if you looked with a quiet mind." If there is a repeated experience around Brother David, it is one of extreme ordinariness. Surely, he's got his (very) unique gifts to share with the world, but he would just remind us that every single person has their unique gifts to bring forth: "A mystic is not a special kind of person. Every person is a special kind of mystic." He carries himself with that kind of equanimity and poise. Growing up in Austria, during Hitler's era, he remembers holding death at the forefront of his daily consciousness. "When I went to the monastery for the first time, I learned that St. Benedict thought of a good monk as someone who keeps death, at all times, in front of his eyes. Well, I certainly qualified," he joked while adding that the idea of impermanence has never left him since. During a conversation around austerities and scandals of monastic orders, I asked him: "Did you ever consider leaving the monastic life?" Very gently but firmly he responds: No. "Not a single thought in all these decades?" "No, because a monk is so immersed in seeking God, that there is no space to ask such a question." Sometime around the year 2000, Brother David's 74-year-old body seemed to be giving way so he retreated to a cabin for the last stage of his life. Lo and behold, his body recovered. He emerged from the cabin with a vision for spreading gratitude in the world, and finding ways to bridge the “noosphere and the Internet” and to use "online organizing for offline living." Mind you, this is a non-techie, life-long monk who was talking about infusing the Internet with values, in its early days! Sure enough, Gratefulness.org launched and millions have benefited since then. "There is a wave of gratefulness because people are becoming aware how important this is. If we're grateful, we're not fearful, and if we're not fearful, we're not violent. Then, we act out of a sense of enough instead of scarcity, and we start to share. We start to enjoy the differences between people, and are respectful to everybody. That can change our society's entire power pyramid," he says, referencing his very-present social change intent. On many occasions, he blessed the work of ServiceSpace and expressed his genuine gratitude for its existence in the world. While doing yard work that morning, I remarked out loud, "One of the three ServiceSpace principles is to not fundraise, not ask, and instead work with whatever is offered. Lot of people don't understand why we limit ourselves like that, but you've lived your whole life like that?" He quickly replied, "Oh yes, that's a very important code of monastery, set up by Saint Benedict himself. It creates the foundation for a strong community." At their monastery, for instance, they don't even serve themselves soup. Subsequently, if you want soup and don't have it, you end up looking to see if others have received their soup. Over time, that becomes an automatic response -- whenever you want something, you first focus on giving that to others. We over me. 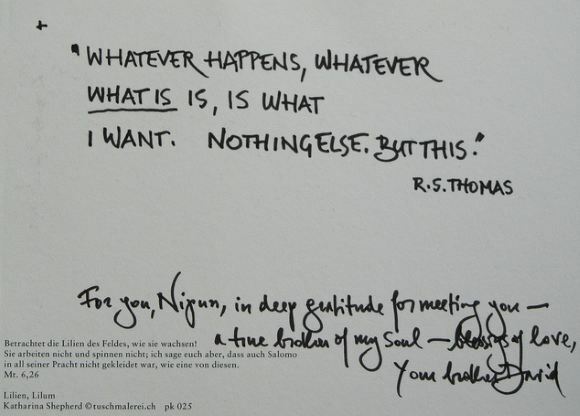 Then, it's easy to see that what I give is what I will have. It completely upends the traditional thinking cycle of wanting, acquiring, and accumulating. It's a principle advocated by many great sages. Buddha instructed some of his cultivated monks go on their daily alms rounds but not to knock on the door or ask for food. Their practice was to radiate out goodwill from their heart; if the homeowner doesn't make an offering, you go to another home and if after eight homes, there is no meal offering, you would just go hungry. Similarly, modern day saint Ramana Maharshi would walk on a new street every day, clap in front of a random house, and receive a meal if someone was moved organically. In the gospel of St. Matthew, there is a great retelling of an animated Jesus driving away transactional merchants and money-changers out of the temple. Mother Teresa would famously say that God was her only fundraiser. :) Master Hsuan Hua, a great Chan meditation teacher from China, built an entire city in Northern California without fundraising. Vinoba, the spiritual successor of Gandhi in India, and his many disciples who are still alive today, create remarkable social change without asking for money. All of these people seemed to know that it is giving that create community, and it is through the grace of noble relationships that we receive. After a rich conversation, complete with humorous anecdotes that only a monk would experience, Brother David concluded with a quote that guides his life: "St. Francis de Sales summed it up well, 'Asking nothing, Refuse nothing.' Then, every place is sacred ground for an encounter with divine presence." "It’s my favorite poem," he later shared. Eighty-eight year old Brother David has helped author 30+ books, given Ted Talks, narrated viral videos, launched a website. Yet he doesn't aim to impress you with content. He touches you effortlessly with his emptiness. After spending a few days together, a quiet reverberation of Brother David's lived truths still resonate in my heart. Ask nothing, refuse nothing. Then, all we will want is whatever-is. With that empty mind, our hearts will open with gratefulness for it all.